If you use hearing aids to treat your hearing loss, then you’re already well aware of the significant benefits they bring to your life. These “mini-computers” for your ears are workhorses, processing sounds from the moment you wake up to the moment you take them out at night. Though they are designed to be tough and withstand many different conditions, hearing aids do have an average shelf life of five to seven years. Even if your hearing aids have not quite reached the end of their use, you may want to upgrade your hearing aids for other reasons. Here are a few scenarios in which you may want to upgrade your hearing aids. Hearing aids are truly sophisticated pieces of technology: they amplify sound, clarify speech, and give you access to different sounds in your environment. Hearing aids reconnect you to the world around you, give you access to communication with your friends and loved ones, and bring significant health benefits to your life (reducing the risk of depression, stress, anxiety, and dementia, to name a few). Over time, as with all electronic devices, your hearing aids may begin to malfunction – even if you’ve taken the best care of them. 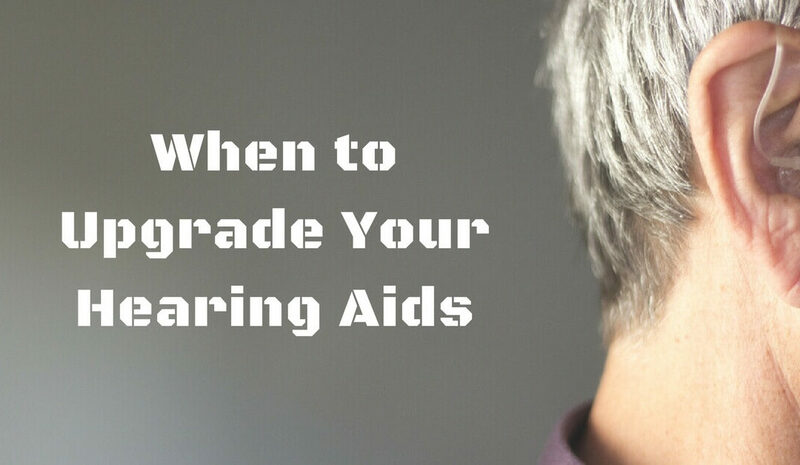 While most hearing aids have warranties and you may go in to your audiologist/hearing specialist’s office for repairs, there may come a time when these fixes no longer do the trick. If you’ve noticed that you’re constantly going in for repairs, or that your hearing aids simply don’t work as properly as they once did, then it may be time to replace them. Our hearing abilities are constantly changing – hence the importance of an annual hearing test. Most hearing aids accommodate a range of degrees of hearing loss, which means the same pair might work even if your hearing abilities have changed a little bit. However, if you’ve noticed that the settings and features that once worked like a charm no longer provide the same clear access to sound – and you’ve gotten repairs – it may be that your hearing abilities have changed beyond the accommodation of the hearing aids. Schedule a hearing test with your audiologist/hearing specialist. If your hearing abilities have changed beyond the specifications available with your hearing aids, then you’ll want to upgrade to a new pair to meet your current hearing needs. Five to seven years is a long time in anyone’s life. When you first got your hearing aids, you may have been working in a different job. In the past few years, you may have picked up a new activity or hobby that may require a different style of hearing aids. For folks who wear behind-the-ear hearing aids, a new pair of glasses may cause discomfort with the placement of the hearing aids. There are many different hearing aid models on the market that can be customized to meet your different lifestyle needs. For people with active lifestyles, there are new technologies that keep your hearing aids better protected from moisture. If your new job takes you on the road constantly, you may want a pair of hearing aids with longer battery life. Whatever the change, there’s a pair of hearing aids out there that might be a better fit for your lifestyle. Ask your audiologist or hearing specialist about the newest models on the market. In the last five years alone, there have been major advancements in hearing aid technology – specifically rechargeable hearing aids and wireless connectivity. Rechargeable hearing aids use lithium-ion batteries that are charged quickly and last up to 24 hours. They eliminate the need for traditional hearing aid batteries and provide wearers with much more confidence in the energy supply of their hearing aids. With wireless connectivity, you’re now able to stream music, movies, and phone calls directly to your ears. This connectivity also allows you to control your preferences through a simple app on your smartphone. Certain models use your phone’s GPS feature to geotag your listening preferences in saved locations, so that when you return, your hearing aids make automatic adjustments. Updates to construction and platforms also provide even better listening features. With feedback from consumers, hearing aid manufacturers have updated hearing aids with better placed microphones, automatic programming, and fast processing to provide better access to sounds. New digital hearing aid technology automatically filters out unwanted background noise and prevents feedback much more quickly than older models, providing a more natural experience. When you visit your audiologist or hearing specialist, ask them about the latest in hearing aid technology. Chances are, there’s something new out there that is an even better fit for your hearing needs!